This week, I am handing the keyboard over to my beloved roommate, fellow foodie, and amateur chef…my boyfriend. That’s right, this week’s post is brought to you by my better half, Tom, so you’ll be getting the “guy’s” point of view in the kitchen. Enjoy! I have always been a chili enthusiast. It is the perfect food for every day from the blustery weekday lunch at work to the “hungover til 6 pm” Sunday. Few foods are more satisfying to me than a bowl of spicy chili with a big hunk of a baguette. Heat – mild, medium, or hot…you can’t go wrong. Brown the meat over medium heat in a large pot (I used our Le Creuset pot because it’s heavier). Add spices, sriracha, and hot sauce. The amount to add is completely up to the cook but I’d suggest starting with small amounts of each since you can always add more (as opposed to adding too much and then being totally screwed). Now add the tomato paste and stewed tomatoes (I prefer to add it to the side of the pot so that it heats up quickly and gets somewhat sticky…I think it tastes better this way). Pour in the beer and give a lengthy stir. I use darker beers but a lot of recipes I have seen call for lighter or “cheap” beer. Pretty much any beer will do for this, I just happen to like the darker beer for the recipe. 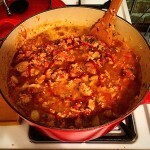 Reduce the heat, cover, and allow this to simmer for 90 minutes without removing the lid or stirring. After 90 minutes, taste the chili for flavor. Add more spices, sriracha, etc. if needed. Stir in all beans (drained). Simmer uncovered for 2 hours. Serve with shredded cheese, sour cream, and a piece of baguette. The quantities listed in the ingredients is meant to serve a party of 10 and required two large pots. For casual meals, cut the recipe in half.